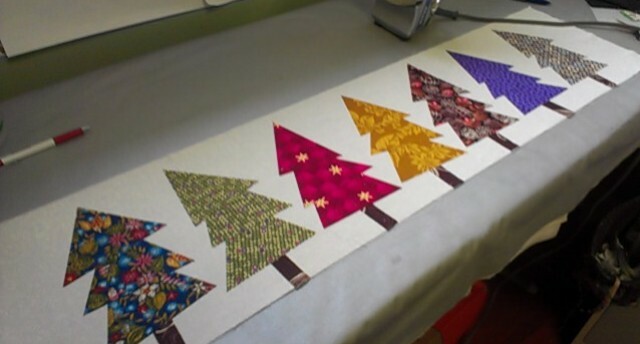 At the Cotton Mill Quilt Guild, we are working on a Row of the Month Quilt. The first month is the Trees. I have it fused, and next is the stitching around the trees. 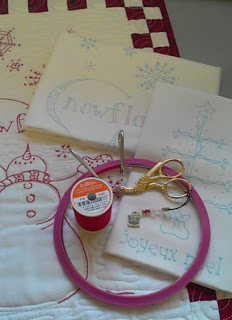 I think I will use black thread and use the blanket stitch on my sewing machine. Joan B. who is leading the Row of the month activity at the guild did her project using up scrappy, and non-Christmas fabrics. I love her quilt, so I'm doing that too. If you want to see Joan's Quilt, and get the link to the free pattern that we are using, just hop over to the Cotton Mill Quilt Guild Blog and the link is here. We will get assigned the next row at our guild meeting on October 15th. Stay tuned. Aurora was here helping me make chocolate chip cookies yesterday. She was taking a big whiff of my special pure vanilla that I bought in Costa Rica last year. "Ahh, it smells so good", she says, "it smells just like a candle!! " When you run in the Run for the Cure marathon, everyone wears a Marathon Tag on their shirt that is pre-printed with "Who are you running for?" on it. I've run and walked the marathon many times, and those little signs attached to the runners backs or fronts get me every time. Some have the word Mom or Sister written on them, and others have the names of friends. 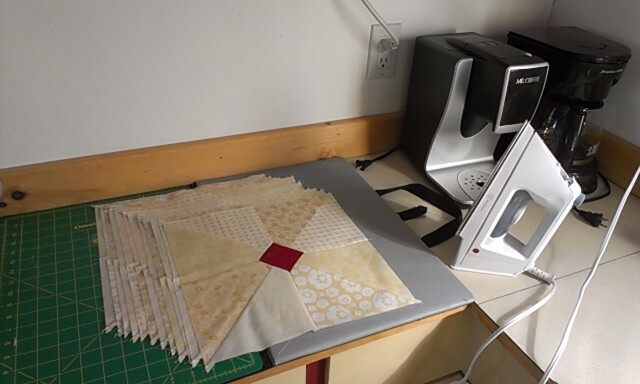 To add to my fundraising this year, I made up a hand stitching/Embroidery kit and had a mini raffle at each of the quilt guilds that I belong to. 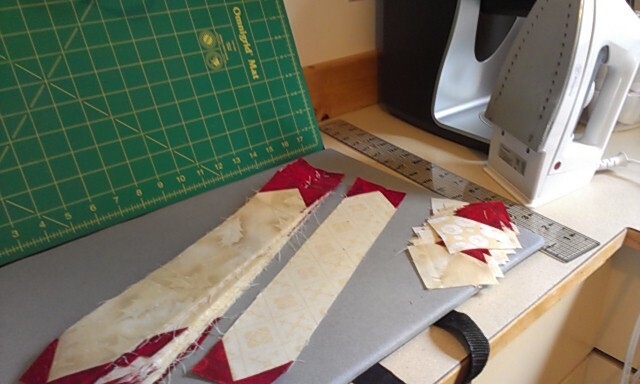 The kit included a two marked pieces, ready for stitching. One would be a practice piece just in case the winner of the kits were a little rusty on their hand embroidery. By the time they finished the little practice piece, they would be confident and anxious to start the larger stitchery. The kit also included a needle case with needles, a threader, scissors and a sparkly scissor charm. Also included was a perfectly sized 5" spring hoop, and a large spool of Sulky Christmas Red 12 wt thread. These were given to me by Diane at Country Crafts and Curtains. (Thanks Dianne). My two guilds are awesome. They are always so good at supporting me. Between the two guilds, I raised $225 dollars for Breast Cancer in our area. I'm so pleased. So, who are you running for this Sunday, September 30th? See you there. 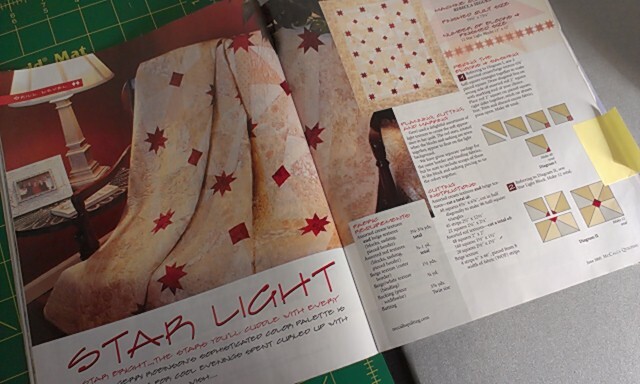 I'm really excited to get a new quilting die for my Sizzix. It took seconds to cut out eight apple cores. Love the notches for easy piecing. As you know, I've been doing some simple hand embroidery lately. I made up this little bag to keep my stitching project and supplies in. This one is a little different than my travel pouch - which I love. I'm not sure I'll like this one as much... I really need a window, but I'll give this a try. I just love the color. For some added bling I also added a little floss charm and crystal to pull the zipper. So here's what I'm thinking. I used machine embroidery to stitch redwork on my handwork bag. Hmm...Is that a little contradictory? Too bad, I really like it and it was pretty quick to make. I'll use it to keep my TV-watching project organized. Some will ask about a pattern, but no particular pattern was used. I loosely used a couple of free tutorials to make it, but not bad for my prototype. I have a Zippy pattern on order which should make my next one easier. I like it for the way the zipper ends are finished. Last weekend I showed you some sewing I did at the cottage. The first sewing all summer because the weather has been so good. It's September and the cooler weather is here. So, that means I will sew on the cooler mornings. Last weekend I stitched up the 12 main blocks. This weekend, I finished stitching the 31 sashing blocks and a small number of smaller blocks . This is definitely a quick quilt to sew up. Next weekend, I'll be doing the layout, and starting to sew it all together. 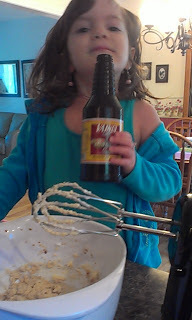 I love the scrappy beiges and reds. I just think that Red just might be my new favorite color. With our first guild meeting night just over a week away, I'm focussed on finishing a community quilt. At our closing meeting in June, there were kits all cut and packaged with a pattern. They were just to easy to pick up. This one has bright fun colors and would be for a girl. I don't know who will get it, but while sewing it up all alone in my sewing room, I think about a young girl who would be going through a difficult time. I wonder how a quilt can make a difference. I hope it gives a bit of comfort. So, are you working on any community quilts? We just got back from a fabulous weekend at the cottage. Sunday was beautiful and all the kids and kiddos were there with us enjoying the day. Saturday was a sunny but breezy day. 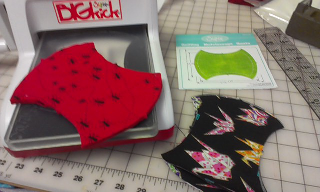 I thought I'd dig out the sewing machine for the first time all summer. I cut a sweet kit that I cut last spring and it's been waiting for a rainy or breezy day. The pattern is called Star Light and is from a June 2005 McCalls Quilting Magazine. It's simple and with my limited room at the cottage, is just the right size. In a couple of hours, I got the first step done, which was pieciing the 12 main blocks. Maybe next weekend, if the weather is cool in the mornings, I'll get step two done. That's the sashing blocks which make the red stars.